I hear they've got a lot of snow in Minnesota. It's raining here, but Wisconsin, Minnesota and Iowa are getting buried. They had to postpone the Giants-Vikings game because the Metrodome roof collapsed under the weight of all that snow. Check it out. The Lebron James Rise ad for Nike opens itself up nicely to retorts and mash-ups. We recently enjoyed Cleveland's response, and now there's Michael Jordan's response. Now that's a mash-up that rings true. Lebron James is no MJ. Driscoll Middle School in Corpus Christi, Texas ran this trick play during their championship game against Wynn Seale on Saturday. They're calling this a really slow quarterback sneak. I don't care if it's legal, it's unsportsmanlike. I'd have refused to participate. I'm watching a bit of the Bills game. It's here in Toronto, so the broadcasters just went through the obligatory "Canadians in the NFL" segment. This one is called Rise and here's Nike's version. After you watch this, be sure to watch my preferred version. Below is Cleveland's response to Nike's Rise ad. This one is much better. I love that we live in an age where Nike can't release an ad like Rise without the communication becoming a two way street. I grew up with the old AL East. It was my beloved Jays along with the Baltimore Orioles, Boston Red Sox, Cleveland Indians, Detroit Tigers, Milwaukee Brewers and New York Yankees. I hated those last six teams with all my heart and soul. I just watched a 30 for 30 ESPN production called "Four Days in October" and it brought me back to a brief period in 2004 when I actually rooted for the Red Sox. Looking back, I think I was transferring the plight of fellow Leafs fans with the plight of Red Sox fans. It was a crazy time, you had to be there. I was blogging here in 2004, so it's easy to follow my flip-flopping and see what turned me. October 12, 2004 / 10:54 EST - I wrote about the curse of the Bambino and explicitly predicted the Yankees would beat the Red Sox in their series. I had no doubts. October 14, 2004 / 10:31 EST - I wrote about former Blue Jays in the playoffs. I stated how nice it would be for John Olerud to play for another title and how likely that was considering the curse. October 17, 2004 / 12:44 EST - With the Red Sox down three games to none, I laughed at those who didn't believe in the curse. "There is a curse and Boston will never again win another World Series. Mark my words." October 20, 2004 / 07:56 EST - Prior to the seventh game between the Yankees and Red Sox, I was looking forward to seeing "what new creative way Boston finds to cough it up". I thought the three game winning streak was "a giant tease to make Red Sox fans believe again." October 21, 2004 / 15:12 EST - Shocked by the Red Sox victory the night before, I start to believe in the impossible. I start to believe the Red Sox could win it all. "Everyone suddenly has warm-fuzzy feelings about all things New England and if they manage to reverse the curse and win the World Series Kerry may ride that Boston high to victory on November 4th." October 22, 2004 / 08:17 EST - I throw my support behind Larry Walker and the Cardinals referring to my "hate on" for the Red Sox and the fact history repeats. October 22, 2004 / 18:11 EST - A Guest Blog by my brother Steve accuses me of brushing the Boston victory under the blogging carpet. In response, I write "I must be the only one who hasn't embraced them." October 27, 2004 / 16:09 EST - I stumble upon a message on a Red Sox fan bulletin board that brings a tear to my eye. "Win it for Ted, who once said, "If they ever won it, I would feel so @#%$ warm inside."" At this point, I'm rooting for the Red Sox as I relate their fans' woes to mine as a die hard Leafs supporter. Yes, it was that damn Red Sox fan bulletin board post that did it for me. It was like they were talking to us Leafs die-hards. In fact, I've written a "win it for" message for this blog when the Leafs return to the Stanley Cup finals. I can't wait to publish it. I haven't rooted for the Red Sox since. Liverpool FC is owned by Americans Tom Hicks and George Gillett. Liverpool FC fans are not happy with their leadership. It's enough to make you wish we Leafs fans had a face to blame for our recent disgraces, the way we blamed Harold Ballard in the 80s. Dear Ontario Teachers' Pension Plan doesn't quite pack the same punch. My bud Vinay Menon linked to an SI slide show on NHL / music collaborations. 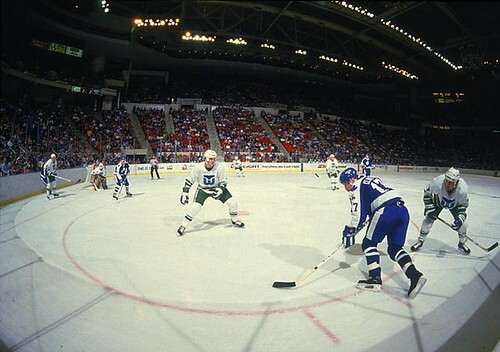 As I was perusing the list I came across this write-up about the Hartford Whalers' Brass Bonanza. Tampa Bay Lightening draftee Vasiliy Koshechkin, whose name is similar to the Russian word for kitten, has decided his goalie mask doesn't need to be intimidating. 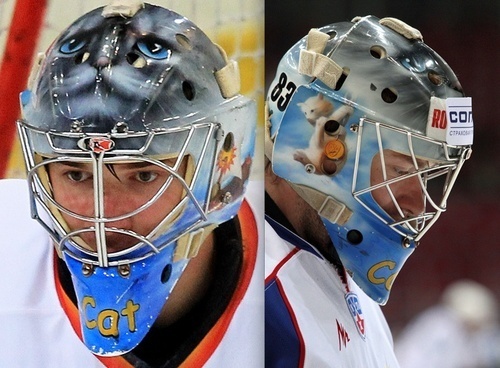 Vasiliy Koshechkin's perfectly comfortable wearing a nauseatingly cute goalie mask. It's hard to believe it's been six years since the Expos played in Montreal. Annakin Slayd put together a nice little tribute he calls "Remember (A Tribute to the Montreal Expos)". I like the use of the TWIB theme.